Baptisms are held on the second and fourth weeks of every month. 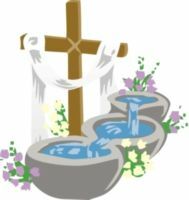 Couples are encouraged to attend the 12 noon mass with the parish community before the baptism at 1 p.m.
To speak with a priest about getting your child baptized at Transfiguration, please contact the parish office at (416) 247-0513 and speak with any one of the priests. Note that you should live within the parish boundaries, if you do not and would still like to have you child baptized at Trans, you must receive a letter from your local parish.